You may not believe it, but archaeology is one of the most difficult fields for the dowser to tackle. Seems easy, doesn’t it? Just walk over the site with the pendulum or rods, and hey presto – the hidden structures appear like magic. Unfortunately, things are not that simple. Almost every square metre of lowland Britain has been lived on, fought over, cultivated, demolished, re-built, afforested or cleared for thousands of years, and every one of those actions has left its mark, either physically in the shape of artefacts and structural traces, or as psychic memories. Try dowsing round an old town and asking if blood has been spilt there – but don’t blame me if you get nightmares. Avoid battlefields, execution grounds, plague pits, and murder sites, (which includes the mass burial sites of culled cloven-footed animals this year), unless you are very well protected. There are a number of controls on archaeological sites – you cannot just go and dig wherever you think something might be found, since a great deal of damage can be done by unskilled excavation. One of the secrets of success in dowsing is to understand as much about the subject as possible before you start. Choose a period that interests you and try to learn about the structures, materials, tools, and way of life of the times as this will help you to hold a clear picture in your mind while you are dowsing and to cut out information from other periods. Remember that your dowsing insight into those who lived, loved, and worked on the site will have a strong influence on your dowsing, and may prevent the mistakes made by geo-physical surveys, which show anomalies underground – so often these are irrelevant to the real archaeology. It is best to start by getting in touch with your local amateur archaeological society – they nearly always know sites where development is planned, and where a rescue dig is needed to establish whether there is anything worth excavating. Professional archaeologists don’t like dowsers very much, even going so far as to disbelieve T. C. Lethbridge – a Director of Excavations for the Cambridge Antiquarian Society and a brilliant dowser with a deep understanding of historical sites. And as you may have seen on Time Team, dowsing doesn’t work with the television cameras in action – why, no-one quite knows, but dowsing and television just don’t go together. Looks more hopeful, doesn’t it? The original building posts would be set in pairs (Fig. 3) with the roof structure spanning them, either by horizontal beams and rafters or “cruck” frames which are curved timbers combining post and rafters in one. There are lots of other things to be dowsed round the Saxon dwelling – there must have been a well or stream fairly near, a boundary wall or hedge, cattle shed and grain store, though in a small house the cattle would have shared the building with the people for safety and warmth. It is possible to find the position of these things and also the location of the hearth and the beds in the house, but there are a couple of traps for the dowser here. The first is “remanence” or the fact that objects leave a trace of their presence after they have been moved, as any dowser knows who has lost his car keys. Ask for the position of the hearth (or well) at a fixed date appropriate to the period and be firm with the pendulum about it. You could try asking for the place where Wulfnoth the Saxon farmer hid his money, but if he or some Norman robber has taken it away remenance will give you a false reading. The other trap is “thought forms”. If Wulfnoth greatly desired to save money, (perhaps for his daughter’s dowry), and planned to hide it under the hearth, he may have left a thought form of the money there, even though it never existed. Difficult, isn’t it? Some people find that an energy line can distort the rod or pendulum readings, so beware of your results if there is an energy line across the site; perhaps you can move it away while you work, but remember to put it back afterwards. You may like to look for other things on the site. 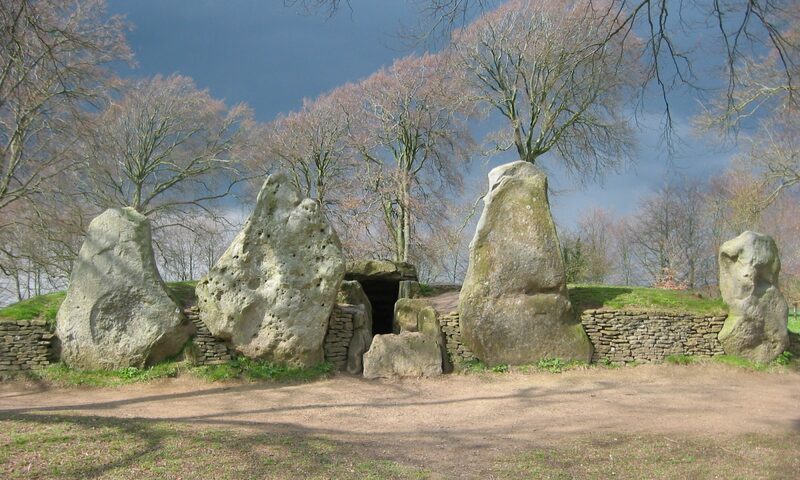 Your local group has some evidence that there was a small hermitage on the same site around 1300 or so. There seemed to be some rectangular lines that came up during your first dowse across the site, so concentrate on those (Fig. 4). This is a bit tricky, since the stone for the walls of the hermitage may have been robbed from a nearby Roman building, so if you ask for C14th stone you will not get the right answer. Also the stone itself may have been taken for another building when the hermitage decayed, and all that will be left is the robbed out trench, and possibly some rough foundation stones. Ask the rods to trace a wall which was built between 1250 and 1350 and see what turns up. Some sort of shape is beginning to emerge; but you will notice that not all the bits of wall you dowsed belong to this building, since some of them probably belong to later alterations to the building, perhaps when the hermit died or went somewhere warmer and the building was used by the local farmer as a cattle shed or a store. The original building may have looked something like Fig. 5, though it is unlikely to have remained exactly the same during the whole period of its existence. Rough buildings like this have a much longer useful life than you would think, and you may like to dowse how long it lasted and what purposes it served. Some dowsers can even identify the people who lived in the buildings, and perhaps meet them . You may at least be able to find out how many people lived there at a given date, and also at what date the dwelling was built. These examples are just to give you an idea of the principles of dowsing for ancient sites, and obviously tackling a large Roman villa or a full sized medieval castle is a much more difficult task. As for dowsing in the City of London with its thousands of years of history, I think it would need an extremely good dowser/historian to get anywhere at all! In a slighter way, dowsers can help archaeologists by checking if there is anything below the level where they are digging – this saves the digger from damaging a delicate object just below the trowel. If you take to digging with a local group yourself, you will almost certainly find that your dowsing improves, as you will become sensitive to the layers of occupation and their appearance on the ground. I have not discussed the techniques of using rods, wands, or pendulums over the ground, as it can be assumed that all members of the Earth Energies Group can dowse perfectly, and that it is only the method of asking the right questions that you need to know.